You have a calling to help people and a desire to advance in your studies. 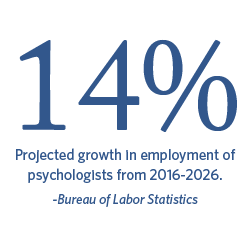 Regent's Bachelor of Science in Psychology— Clinical & Counseling Psychology degree will teach you how to think about psychological issues logically and responsibly. Explore coursework in case management, marriage and family, group facilitation, counseling skills, and assessments—all presented from a Christian worldview. Learn case management techniques, treatment planning, effective referral methods and crisis intervention skills. The historical and contemporary philosophical foundations of psychology with an emphasis on the interface between Christian theology and psychology. The relationship between Christian theology and secular philosophies commonly discussed in the field. Prerequisite: PSYC 102. Examination of the major theoretical perspectives related to physical, cognitive, language, emotional, spiritual, and social development in people over the life span. Examines the major schools within personality theory with a focus on contributions and usefulness in understanding human behavior, the principal theorists from each school, the limitations of each theory, and comparisons between theoretical perspectives. Considers the systematic process by which to conduct research as well as the various research methods that can be used to acquire and advance knowledge. Introduction to methodological concepts used in the study of society, to the formal steps of the scientific method, to various research processes, to quantitative and qualitative methods of investigation, and to the communication of research results via research reports. Prerequisite: MATH 201. Examines case management principles and techniques, treatment planning, effective referral methods, and crisis intervention skills used in human services and addiction treatment. Study of marriage and family from various perspectives, including the theories of and methods used to research marriage and the family, the diversity of families, contemporary gender roles, love and commitment, systems, communication and conflict resolution, sexual relationships and problems, pregnancy, childbirth, parenthood, care-giving and spiritual concerns. Continuation of PSYC 313. Students examine research topics and complete research projects according to American Psychological Association requirements. Students apply research and statistical principles including the use of SPSS. Prerequisite: PSYC 313 or concurrent. Students will be withdrawn if prerequisite is not successfully completed. Survey of various categories of abnormal or deviant behavior such as developmental, personality, mood, psychophysiological, psychotic, anxiety, somatoform, chemical dependency, and dissociative disorders. Prerequisite: PSYC 102 or equivalent. Explores the key aspects of the group process including communication patterns, both verbal and nonverbal, as well as leadership, trust, cohesion, risk-taking, group membership skills, facilitation skills, group problem-solving, decision-making, conflict resolution, interviewing techniques, and summary session report-writing. Provides both a group experience and a theoretical analysis of group process. Study of the biological bases of behavior with an emphasis on the role of the nervous and endocrine systems. Topics include: attention, learning and memory, sensation and perception, sleep, language, reproduction, emotions, aggressive behavior, addictions, and behavioral disorders. Prerequisite: PSYC 102 or equivalent. Study of recent research and theory in cognitive processes concerning the representation, storage, retrieval, forgetting, conditioning, learning, concept formation, problem solving, and memory. Examines theories and research in the study of psychosocial issues of racial, ethnic, and cultural groups as well as an exploration of the relationship of race, culture, and social class in psychological development. Introduces the development of the communication skills used in interviewing and counseling with an emphasis on the necessity of understanding the interpersonal dynamics between the human service worker/counselor and the individual client. Survey of theories and research in the major areas of social psychology including perception, attitude change, attraction, aggression, altruism, conformity, prejudice, values, and group dynamics. Prerequisite: PSYC 313 or permission of the instructor. Examination of the interdisciplinary connections within the subfields of psychology and interpretive philosophical models of the field with an emphasis on Christian thought and practice. Students apply intradisciplinary connections of the field and specific philosophical models to historic and current topics. Prerequisites: Psychology majors only who have completed a minimum of 6 upper-level psychology courses (18 credits). Theory and techniques of psychological assessment including the statistical foundations of testing and assessment, principles of psychological measurement, and the most common domains of testing such as cognitive ability, achievement, interests, and personality.